Pets are to be under the control of the owners at all times and must kept on a leash. Please clean up after your per while walking in the resort and at your campsite. Pets are not permitted to be at the swimming pool/spa, activities pavilion, fishing pier, bocce ball, horseshoe, mini-golf or any other common areas throughout the resort. 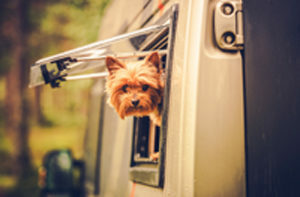 In the event that you will be leaving your pet alone in your camper, please notify the office and leave a cell telephone number so that we can reach you in the event of an emergency. Pets are not permitted to be left alone outside of your camper at any time. Please have a copy of your vet record available. Please refer to our Resort Guidelines for the Pet Policy for our seasonal camping sites.